The colours are all from Stampin’ Up!, and from the top left in clockwise order are Pear Pizzazz, Wisteria Wonder, So Saffron and Pool Party (all from the Subtles range). The butterfly is white heat embossed on vellum, turned around so that the embossing is on the back because I wanted it to be more subtle than it looked the right way around. I only wish I could come up with something as cool as The Card Concept #37 (The Butterfly Effect) theme picture! Another great card Sue. Love it. Thanks Narelle. It is rather fun! Oh, this is gorgeous! I love the butterfly embossed on the vellum! Wonderful take on the sketch! It is a little harder to capture vellum on camera, that’s true! I just made a card with some vellum this morning — it’s very fun! And so pretty! I think my main vellum photography problem is that the embossed image is on the BACK, to deliberately make it look soft from the front. My camera just can’t handle that and all the focus modes just move the focal point constantly trying to get a sharp image, which will never happen. P.S. I’d love to see your vellum card too! Lovely card Sue! Beautiful use of the vellum! Thanks for sharing it with us over at ATCAS! Thank you Joanna! This was fun, and I’ll definitely be around at ATCAS in the future! Love these colors, Sue! And the butterfly on the vellum is perfect to let the colors show! Thanks for sharing with us at ATCAS! Sue I am delighted that our sketch inspired you! Thanks for joining us at Case this sketch and The card concept! I think that you captured the card quite nicely. The colors are beautiful and the butterfly is perfect! Great job on the challenges! Fabulous design. 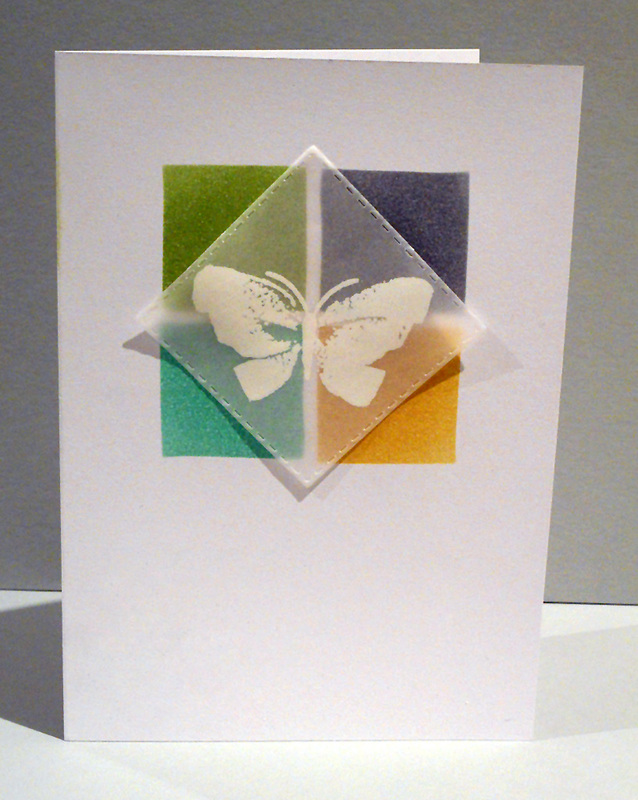 Love the vellum layer with your embossed butterfly … so pretty! Thanks for playing along at ATCAS. That butterfly is so sweet, and a beautiful focal point! Lovely card. Thanks for joining us at The Card Concept! Thank you, Julie! It was fun, and I’m looking forward to the next round!